crawfordroad.org - Building the Crawford Road Community. 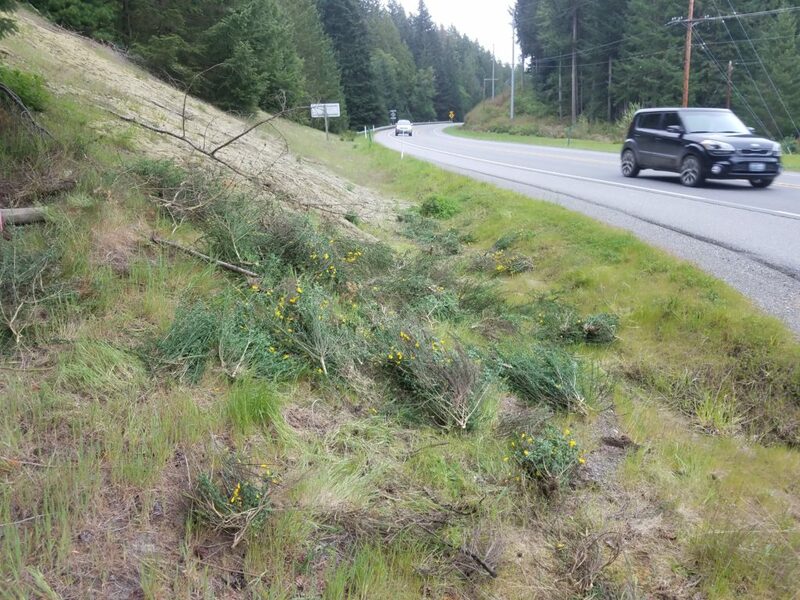 We need to kill the Scotch Broom. And right now is the best time! 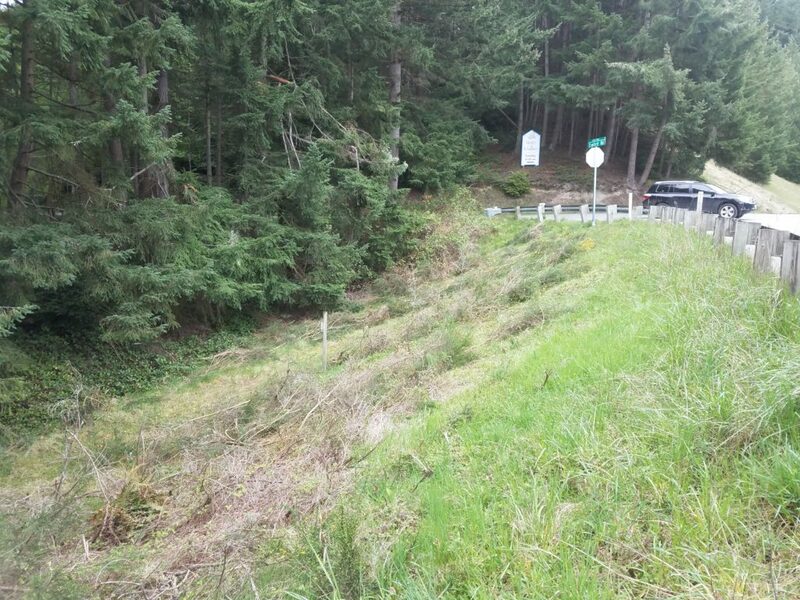 We’ve begun to chop and pull the Scotch Broom along Crawford. We started at the intersection of 525 and Crawford and we’re working our way north. And honestly? It’s quite satisfying! Why always only one shoe??! On April 18th we met with FCS and representatives from the county to discuss the status of the economic development plan for the Whidbey Airport Access Project (the new road). Present were Mary, Max, and JP. We had a great discussion and a ton of good information was presented. First, FCS provided the February Meeting Notes for our review. Second, FCS provided the Task 1 and Task 2 Findings. which includes a wealth of information about the growth of Puget sound over the next few decades, including detailed statistics about the economics of Whidbey Island – where we work, what we work doing, which industries are under served, housing trends, and other awesome data. It’s worth a look, even if you aren’t interested in the Access Project, just to get a glimpse into the future. From these statistics, and taking into account the available land and market segments, FCS has determined that from four to six full time jobs could be added annually to Whidbey by completion of the project (assuming existing septic limitations). The lead consultant on the project offered a considered opinion that this would probably qualify for grant approval. Becky, from Island County Planning, has a follow up meeting scheduled for the community where we will be able to give input on zoning for our area – what’s working, what’s not working, and what we would like to see. She had several exciting ideas for us, including possibly incorporating a mixed use zoning that Freeland has adopted which allows for living / manufacturing / retail and teaching space to be permitted. She is very excited to get our input. There’s a LOT of information to convey, and we’ll be setting up a meeting for those parties that are interested to discuss, before our next meeting with FCS in June. Watch this space for a meeting announcement! 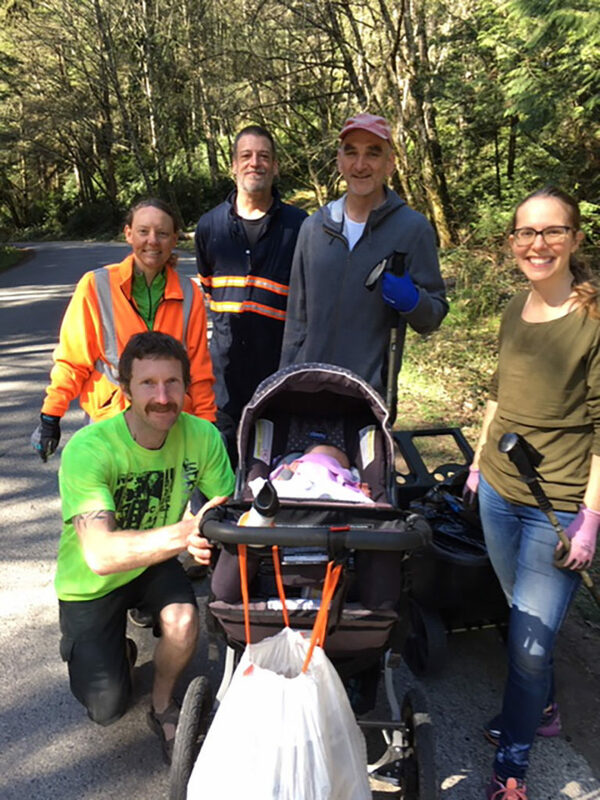 Our spring trash clean up and road design walkabout was a great success! A lot of ideas were exchanged, a lot of trash was picked up and disposed of, and a good time was had by all. 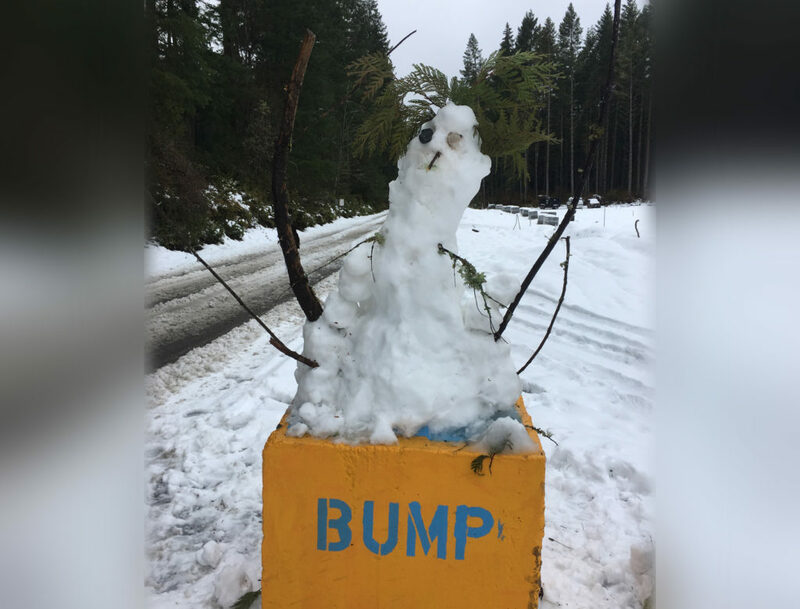 Crawford Road community starts early. Since this work is ongoing – every little bit helps. If you happen to notice litter and can pick it up and dispose of it, that’s awesome! Thank you!! 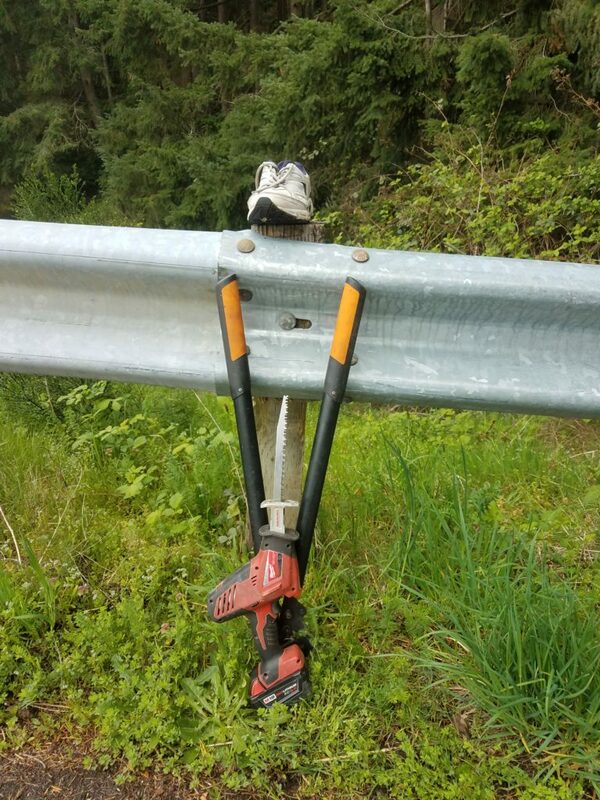 We continue to research economical collection points as a more permanent solution, but just being out there on the road, and being seen to pick things up as a community matters! 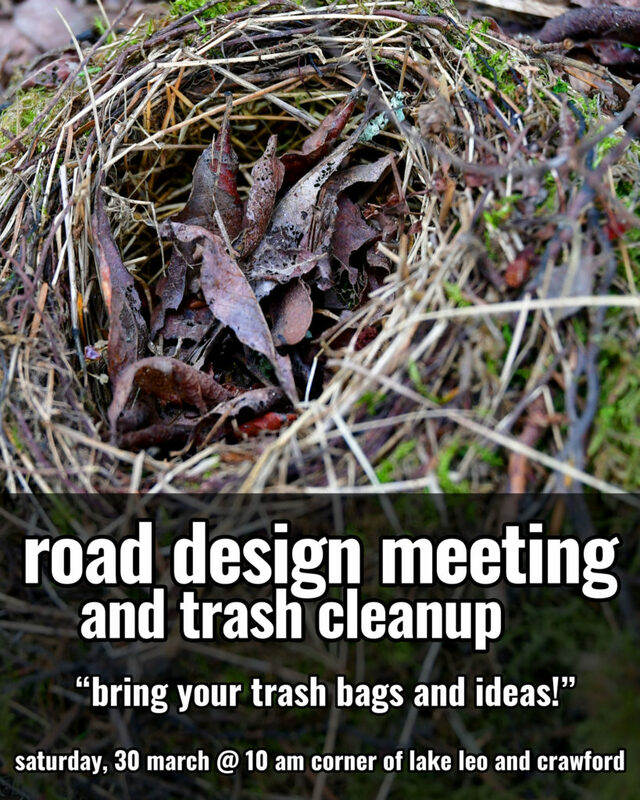 Road Design / Trash Clean Up! 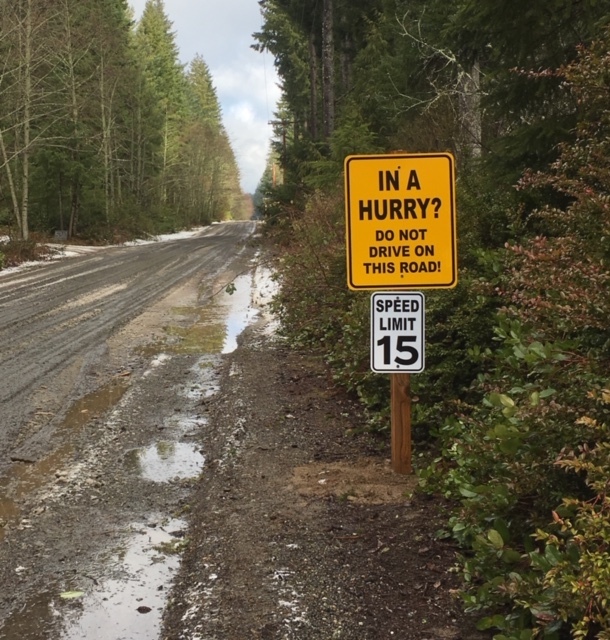 We’re looking forward to seeing you all at the Road Design Meeting, coming up Wednesday, March 13 at 3 PM at Mukilteo Coffee Roasters. Everyone is welcome, and we’d love to hear your ideas! To get you started, here’s a copy of the agenda. Thank you all for attending the annual meeting. We got a lot done, and your input is immensely valuable. We appreciate it! As requested, we’ve added a contact form to the website. If you have questions, feedback, or just want to reach out and talk, go ahead click on the “Contact Us” to the right. The form will send us an email, and we’ll get right back to you! 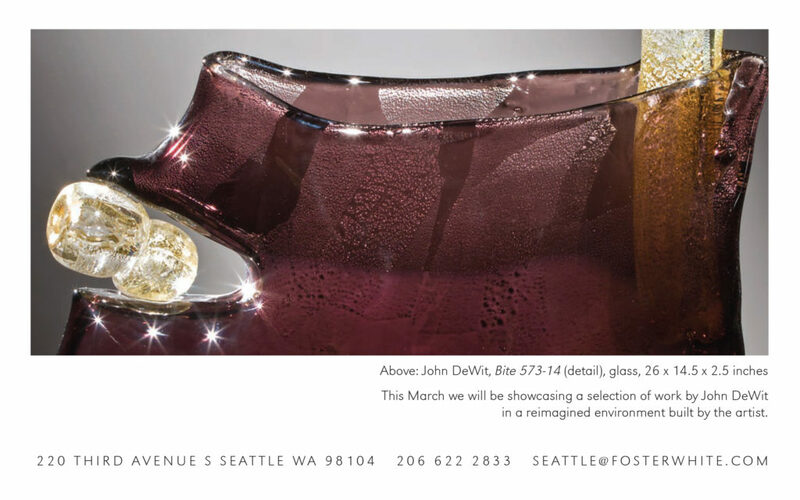 Our neighbor, John DeWit, is having an exhibition at the Foster White Gallery in Seattle. He’s showcasing a completely reimagined environment for his work! Just a quick reminder that our annual meeting is coming up Wednesday. We’d love to see you there! Strange forest creatures emerge from the snow.